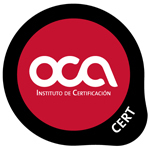 OCA Instituto de Certificación is an entity recognized by theENAC for the certification of the standards ISO 9001, ISO 14001, ISO 27001, agri-food products, food safety systems such as IFS Food, BRC Food, ISO 22000, aas well as for the assessment of compliance with the EC marking regarding construction products, lifting equipment and pressure devices. Moreover we are authorized by the ICTE (Spanish initials for the Spanish Institute for Tourist Quality) to carry out the certification audits necessary to grant the Q of tourist Qualityas well as certification audits regarding Corporate Social Responsibility,occupational risk prevention and acute healthcare centers. Established in 2010, OCA Instituto de Certificación is a Spanish private-capital company stemming from the acquisition of Calitax Certificación, which was set up in 1960 as one of the first certification entities in Spain. With 50 employees, OCA Instituto de Certificación belongs to the OCA CS Group, with a total staff of over 650 people, offices all over Spain and more than 30 years of experience in quality, environment, workplace safety, social responsibility and food safety. Waf Estructuras Digitales is a major solution developer that combines “physical” security, smart video surveillance and a large business structure to integrate vertical and horizontal solutions. At present our solutions help institutions, administrations and companies of any size to protect their people and facilities, prevent losses and damages and improve their effectiveness at the same time. There are an endless number of possibilities for our clients and distributors. Our Mission is to “Identify, analyze and meet the real needs of our clients by means of innovative and distinguishing solutions based on Information and Communication Technologies that create value to the company’s stakeholders”. Our goal is to provide our clients with the technical solution that best fits their working conditions as well as an efficient management environment for the control of their production process. Within the Food Defense program, Waf takes care of the necessary technology to implement the procedures related to the requirements set by the regulations. This technology (exclusively owned by Waf) makes it possible to integrate data with video systems. The goal is to provide our clients with a system to monitor, supervise and manage all the critical points of the production processes with a powerful and simple interface. Masscomm, is a value-added wholesaler specialized in commercializing telecommunications, data, videoconference, security and digital signage products and services. In Masscomm we always count on the trust and endorsement of leading brands, reaching the maximum levels of certification. Masscomm distributes, among other brands, Alcatel-Lucent, Panasonic, Plantronics, ALCATEL Phones, SelectaDNA, Optasense, Ibernex, Radvision, LifeSize, Polycom, Konftel, Waf, Lilin, ZKSoftware, Axis, Bosch, Grupo Guardal, Fritz AVM, Jusan, Char, Himel Infra+, Aurall, Gigaset, ITS Telecom, Xacom, Stentofon, Optimus, Fonestar, LG, Spinetix, Senao, Teldat, Allied Telesis, Daewoo, Motorola and Brickcom. Such a large portfolio of manufacturers enables masscomm to provide companies with all types of communication solutions, ranging from voice, data and video applications, call centers, land lines, headphones, audio and videoconference systems, communication wiring and cabinets, call rate calculators or uninterruptible power supplies (UPS), to the division of video surveillance systems, physical security with smart video surveillance and digital signage.